You can create a form in Microsoft Word by starting with a blank document or template and adding content controls, including check boxes, text boxes, date pickers, and drop-down lists. Other people can use Word to fill out the form on their computer. In an advanced scenario, any content controls that you add to a form can also be linked to data. Note: You can print a form that was created by using content controls, but the boxes around the content controls will not be printed. Follow these steps to create a form in Word. Click the File tab, go to Options, > Customize Ribbon. To save time, you can start with a form template. Or you can start with a blank document and save as either a document or template to re-use in the future. Search for Forms in the Templates search box. Click the form that matches the type you want to create. Click Download if you're using Word 2010, or Create if you're using Word 2013 or 2016. Click the File tab again, click Save As and pick a location to save the form. 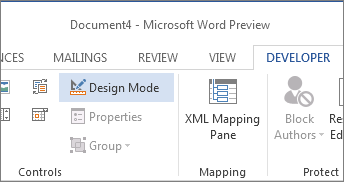 If you want to create your own template, start with a new document and save the new document as a template. In the form document you've created, click the File tab. Under Save as type, select Word template from the menu. On the Developer tab, in the Controls group, click Design Mode, and then insert the controls that you want. On the Developer tab, in the Controls group, click Rich Text Content Control or Plain Text Content Control . Note: July 11, 2016: If you try to use the picture content control as a template in Office 2016, but you're unable to, update to Office 2016 build 16.0.6965.2063. To get the update immediately, open any Office 2016 app and click File > Account > Update Options >Update Now. To find out more, go to our release notes page, and under Channel, click Current. On the Developer tab, in the Controls group, click Picture Content Control . You can use building block controls when you want people to choose a specific block of text. For example, building block controls are helpful if you’re setting up a contract template, and you need to add different boilerplate text depending on the contract’s specific requirements. You can create rich text content controls for each version of the boilerplate text, and then you can use a building block control as the container for the rich text content controls. On the Developer tab, in the Controls group, click Building Block Content Control (in Word 2016, this is labeled Building Block Gallery Content Control) . 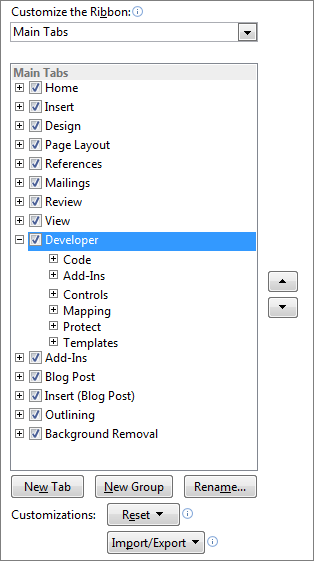 On the Developer tab, in the Controls group, click the Combo Box Content Control or Drop-Down List Content Control . Select the content control, and then on the Developer tab, in the Controls group, click Properties. On the Developer tab, in the Controls group, click the Date Picker Content Control . On the Developer tab, in the Controls group, click the Check Box Content Control . Click where you want to insert a legacy control. On the Developer tab, in the Controls group, click the Legacy Forms drop-down. Select the Legacy Form control or Active X Control that you want to include. On the Developer tab, in the Controls group, click Properties, and change the properties that you want. On the Developer tab, in the Controls group, click Design Mode. On the Developer tab, in the Controls group, click Design Mode to turn off the design feature and save the instructional text. Protecting a form means it can't be changed; ﻿people can fill out a protected form, but they can't change the controls or control properties. Tip: Test the form prior to distributing it. Open the form, fill it out as the user would, and then save a copy. Select the content controls to which you want to restrict changes. Tip: Select multiple controls by holding down the Ctrl key while you click the controls. On the Developer tab, in the Controls group, click Group, and then, if prompted, click Group again. Select the Content control cannot be deleted check box, which allows the content of the control to be edited but the control itself cannot be deleted from the template or a document that is based on the template. Select the Contents cannot be edited check box, which allows you to delete the control but does not allow you to edit the content in the control. Use this setting when you want to protect text if it is included. For example, if you often include a disclaimer, you can help ensure that the text stays the same, and you can delete the disclaimer for documents that don't require it. On the Developer tab, in the Controls group, click the Rich Text control or the Text control . Important: Spell Check will not flag any errors that are typed in the text form field. If you want to run Spell Check, use the Rich Text control or the Text control. To add a line under the field, select the field, and then click Underline in the Font group on the Home tab. To limit the amount of information a person can type in the field, set a maximum width by selecting the field, clicking Properties in the Controls group, and entering a value under Maximum length. To make the field look as long as its maximum length, add instructional text by clicking Properties in the Controls group, and typing text, such as Type your first name here, under Default text. On the Developer tab, in the Controls group, click the Drop-Down List control . Click Check Box Form Field. Type a space, and then type a label for the check box. To remove the shading from the check box, click Legacy Tools, and then click Shading. Note: You won't be able to select or clear the check box until you protect the form. If you want the content control to disappear when someone types in their own content to replace your instructions in a Rich Text control or a Text control, click Properties in the Controls group, and then select the Remove content control when contents are edited check box. You can protect individual content controls in a form template to help prevent someone from deleting or editing a particular content control or group of controls, or you can prepare a form to be distributed and filled out by locking it. You can help protect all of the form template content with a password. Select the content control or the group of controls to which you want to restrict changes. Note: This option is not available for all controls. Open the form that you want to lock so that it can be filled out. Important: If you choose not to use a password, anyone can change your editing restrictions.